Although it has been another quiet month for the community, a few projects are making strides towards some exciting changes in the months ahead as new projects get their start and others are set to begin as we end the summer. Spells of Genesis recently celebrated 2134 blockchainizations of their in-game cards on July 3rd. For those who aren’t aware, the term ‘blockchainization’ refers to the method that allows Spells of Genesis players to take an in-game item and make a blockchain asset. Whilst there were already blockchain items that players could use in-game, this method requires users to ensure that their cards are quad-fused and fully leveled up. Players can also only blockchainize 3 cards per month with Parent company, EverdreamSoft, taking on all fees. These in-game items would then appear in any Counterparty supporting wallet. To stay up to date with Spells of Genesis follow their public roadmap. In further news from parent company, EverdreamSoft; Founder, Shaban Shaame, is giving the Spells of Genesis and BitCrystals community 4 days to submit ideas as to how to better serve and use their gaming community. As a reward, Shaame will distribute a reward of $200USD in Bitcoin. To read more click here. I'm organising a challenge ! BitCrystals launched a blockchain asset creator this past month. With the online tool, the team behind the project has produced an easy guide alongside the tool, to allow users to publish their designs as blockchain tokens. The tool falls in line with the design-heavy nature of BitCrystals’ CrystalsCraft environment on Book of Orbs, and the upcoming Soap Arena project. To learn more, click here. Soap Arena, as mentioned, is EverdreamSoft’s and BitCrystals’ latest venture into Blockchain publishing. Currently described as a “2D strategic brawler”, Soap Arena will utilize BitCrystals within pixel art graphics, with hero characters for users to lead throughout gameplay. For more news as it happens, follow Soap Arena on Twitter! Book of Orbs news follows with a couple of articles via the project’s medium platform. The first comes in the form of a how-to guide for users wishing to use Book of Orbs’ relatively new Web application and its RBF function. RBF – aka replace by fee – is a handy function for users utilizing the custom fee setting, when making a transaction. The guide is a useful tool for less advanced users, who don’t wish to use in-app fee presets. Check it out here. The second article welcomes Casa Tookan to the BitCrystals ecosystem. As mentioned in the last newsletter, Casa Tookan is a multi-chain wallet and third-party hosting application, launching this September. This article contextualizes Casa Tookan for Book of Orbs users; especially given the prevention of new installs of the app, for the iOS app store. Check it out here. In other news, the Bitcrystals team published a guide on how to obtain BitCrystals from both Bittrex and Poloniex recently. However, news sadly follows that BCY (BitCrystals) is being delisted from Poloniex alongside some other cryptocurrencies. An order, a bid, an ask…? It's not always easy to get #cryptocurrencies. IndieSquare continues to progress with their recently launched ‘WebXCP’ standard. The protocol that allows developers to make XCP web apps has since reflected these changes within its own wallet. Having started to list decentralized apps – aka DApps – the IndieSquare Wallet is set to feature many Counterparty-based applications. Separated into two groups, you will ultimately find both in-wallet apps such as Pepe Arcade, and native iOS apps (and Android alike) such as Spells of Genesis and Takara. IndieSquare Wallet also supports Ethereum-based apps with this new standards, with lightning network apps and wallet functionality soon to be added also. SaruTobi Island launched chapter 3 recently. In this third edition of the RPG (role play game), SaruTobi is tasked with stealing a crystal from the confines of a castle. The next chapter of SaruTobi Island will also feature a collaboration with Age of Chains. In a recent tweet from developer Mandel Duck, he also provided a few developments on the Sarutobi Universe as a whole. The original 8-bit game featuring the Monster Rancher Monkey is now in beta for its lightning network, web mini-game edition. You can try it here. As the thread from the tweet continued, he revealed that a planned development for a mobile edition and tipping system is coming in the near future. SaruTobi Lightning Web mini game is in beta! Swing the monkey see how far you can fly! FoldingCoin has some unfortunate news this month. FLDC – the project’s currency – is sadly being delisted from Poloniex alongside BCY. The FoldingCoin team is advising its community to withdraw their funds, urging those who fold directly to a Poloniex address, to change their FLDC address in their Folding username as soon as possible, or their funds will be continued to be sent to Poloniex addresses – despite this news. In other news, the FoldingCoin team has been working with Tokenly to update Merged Folding to integrate with their new API and has begun a discussion to create a stats page with Tokenly. For more about FoldingCoin, please attend their public meeting this Saturday at 10am EST here. Age of Rust is hosting a new logo design contest. With 47 designs to choose from, click here to help the team decide which logo will front the game upon its release. Continuing to celebrate the progress of the game so far, the Space Pirate team behind Age of Rust tweeted some before and during graphics of the game’s progression. The tweet really celebrates the strides of indie game production within the Counterparty community. In a development update on medium, the team elaborates more on what gameplay will be like; making a point to stand apart from other projects on the blockchain. Self-described as a “first person adventure game where you solve puzzles, explore vast areas, and if your [sic] lucky, find a treasure in cryptocurrency”. Age of Rust compares itself to Myst. The post goes on to expand upon its premise and gameplay, as well as explain its in-game currency and rewards. Finally, the team teased a week ago about some big news coming soon! Be sure to follow the Age of Rust project on Twitter to find out the news as it’s revealed! Augmentors’ alpha battles campaign starts today, ending August 7th. Featuring a revamped UI (user interface), some players will have experienced a similar campaign back in March. For more details click here. Mafia Wars has been gaining traction in the Counterparty community recently. Earlier this week, a whale – a term for someone with money to spend – bought up 20% of the game. Additionally, more than 100 cards have been created for the game of idleness in the last month alone. As usual, these cards are featured via the project’s Twitter page. Notably, a lot of Rare Pepe designs have popped up, with the Frog being highly popular within the Counterparty community. In Counterparty news this month, Age of Chains was interviewed by Cryptobit games. The article discusses the project’s origin and premise before discussing Age of Chains’ roadmap for the future. Check it out here. Spells of Genesis was covered in an article on Gadget Helpline. The article covers the game’s premise with some suggested tips from the writer as to how to get started. Also mentioned, is Book of Orbs and the BitCrystals economy, following reference to the game’s blockchainization element. Check out the article here. Spells of Genesis was also mentioned among other projects in an article by Bit Starz, discussing how blockchain will change the video game industry. The article goes on to discuss how the mainstream gaming industry such as Microsoft and XBOX, is starting to embrace the blockchain and tokenization, and what this could mean. Check it out here. In more news from the EverdreamSoft family, BitCrystals was featured in an article on blockchain gamer.biz, mentioning their recently launched ‘blockchain gaming market sector’ map. In other news, Jason Bailey recently published an article on Art Nome covering a recent visit to Christie’s; a 250-year-old auction house, summit on Art and Technology. There, Bailey covered a panel called, “Exploring Blockchain — Is the Art World Ready For Consensus?”. Bailey’s article compliments Christie’s concise understanding of Blockchain’s ethics and methodology but disagrees that art mediums such as Christie’s auction house are ready for the Blockchain. To read exactly why Bailey thinks this (with a swift nod to Rare Pepe Wallet and its founder Joe Looney), check out the article via the jump. 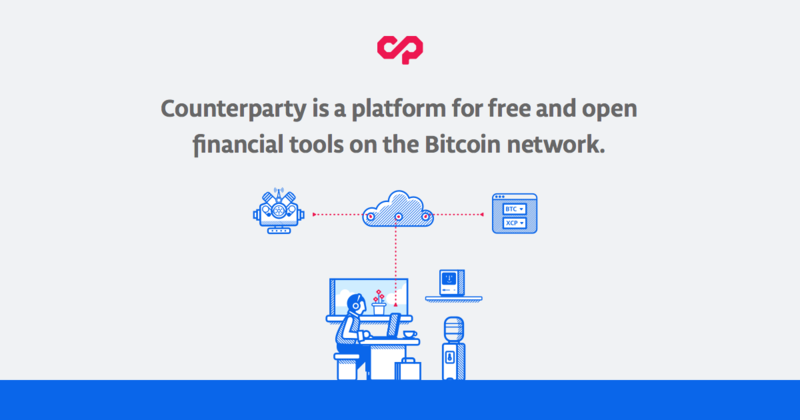 Counterparty continues to work towards improving its protocol and progress with CIP development; with the development efforts coming from John Villar, FoldingCoin, and IndieSquare. Thank you again for your patience during this slow time. Please stay up to date with our social networks regarding any other CIP-related matters. Notes for meetings Dan Anderson recently held for interested developers to attend can be found here. 1) Work has started on integrating the indexd branch to master as this will allow XCP to use the latest features from the Bitcoin daemon and lower the maintenance burden. (Special thanks is extended to btcdrak for all their support during these years with their txindex fork). 2) The FoldingCoin team has started to devote some of their workforce to maintenance duties on the code, namely PR review on the latest CIPs. 3) Chris Moss (aka Mandelduck) is going to get full commit access to the repos thanks to his long-standing record of positive collaboration with the ecosystem. 4) The RarePepe.party team is working on getting MPMA (CIP10) ready for the release of the indexd support, so the booster pack sales start functioning right away. 5) A new project is using Counterparty technology in private blockchains to create an advanced and secure trading platform called Virtual EXchange Engine (VEX for short). The main advantage of this is that their changes could bring “controlled” markets and special trading pairs with fees that feedback to the token owner. You can stay up to date with current and future CIPs, as well as links to relevant GitHub pages via the Counterparty donate page.